Care staff had to help me out of bed this morning. It happens increasingly often these days, as my incurable disease and my unfit body's slow ageing makes its mark. Some mornings, being lifted hurts so much I cry. It's only a matter of time before I end up wet in bed and need a commode and then a nappy. I regularly tip coffee down myself in the mornings because I can't hold a mug, and I still can't type properly because it takes two hours for my hands to warm up. I am only 36. I'm pretty lucky actually. I am reminded almost every year by a social care manager that if I was childless I wouldn't qualify for care at all - in which case I'd be lying here alone with a bladder full to bursting, paralysed by pain and stiffness. Instead of writing and drinking coffee, I'd be trying to work out how to make it to the toilet before I wee. My life, what there was of it, would be pretty unbearable. Nobody wants me to suffer. I don't want to suffer. My friends and colleagues don't want me to suffer. Neither do my doctors, my care manager, either of my beautiful girlfriends, or my three wonderful kids. If I died tomorrow, it would indeed end my suffering. If I said I wanted to commit suicide when it all gets too much, many people would support me and think the state should do it for me. If I said I wanted to die, would you rage at the state for not offering me a final solution? It seems acceptable these days to suggest that being ('kept') alive is a kind of abuse. Polly Toynbee, for example, calls the 1961 Suicide Act - whose guidelines are now being re-written in the light of Debbie Purdy's case - "an instrument of state torture". She notes that "every poll in the last decade has shown between 74% and 87% of the public want the terminally ill to have the right to ask a doctor for a peaceful death." The majority of the public are not disabled and not sick, so they have no direct knowledge of the subject. Their opinions are based on such things as prejudice fed by the media and government, witnessing the neglect of people they know or fearful fantasies about their own potential suffering. 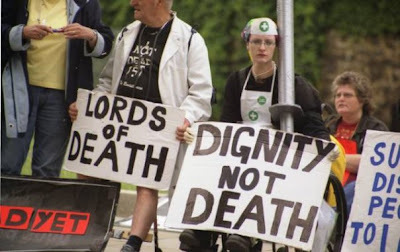 Many support the idea of death clinics because they believe that most severely sick and disabled people want to end their lives, and just couldn't do it themselves. In that case, why don't more of them simply direct their electric wheelchairs into the nearest river? If a healthy, non-disabled friend told you that their life was unbearable, and asked you to kill them, and they were really serious, would you help them to find a way to die? Or, would you ask them why and offer them support? Would you maybe suggest solutions to the problems causing their misery? Would you send them to the doctor? Faced with a suicidal patient who is physically healthy, a doctor will most likely offer antidepressants; if your friend is lucky they may even get therapy to help them look into how they could feel better and what could improve their life. The help offered to people with such feelings is often inadequate - patients who have slashed their arms in miserable failed suicide attempts are sometimes patched up and sent home from casualty with no further support. But however strapped for cash the health service is one thing they won't do is offer to finish the job off properly. There's a reason for that - our healthcare system is here to save lives, to treat and cure. The Hippocratic Oath states that quite clearly. Thanks to doctors' traditional ethics - and their knowledge of the real issues people face - we currently don't have a healthcare system that aids and abets suicide. Thank goodness! Suicidal tendencies are not exclusive to disabled or sick people. Lots of people who have lives filled with struggle or abuse, people who feel their lives are worthless, or who are having a miserable life, feel they want to end it all. But in the general population suicide attempts are seen as a cry for help, whose solution is to offer people help to live. Only people with physical health problems or impairment are ever seen as being mentally competent when they want to kill themselves. So why do politicians and campaigners propose suicide clinics exclusively for us? My friend Liz Crow, a filmmaker, artist and disabled activist, recently graced Anthony Gormley's Fourth Plinth in full Nazi regalia to point out the similarity between today's discussions and the eugenics promoted by the Third Reich. She comments in the film "Protest on the plinth"
They put across the idea of disabled people as suffering and deserving of mercy killing, in other words they're doing us a favour, by putting us out of our misery. Or where that doesn't work, they put us across as an economic burden and therefore it's in the interests of families and our nation and so on, to kill us. Three hundred and fourty thousand people live in institutions in the UK. Underlying all of that is still the same set of values, about us as other, and lesser. Despite the slow march towards equal rights for disabled people and people with long term illnesses, the government would prefer to ration healthcare, while social services are underfunded to the point that they now refuse support to anyone not in serious crisis. Meanwhile, the media are running ahead, misleading the public that disabled people's lives are terrible. They rarely consider the reasons, other than our impairments, why we might be having such a bad time. Social isolation, abuse, lack of equipment, being dumped in institutions, lack of opportunity, poor healthcare, insufficient support, and inaccessible housing all contribute to making people feel their lives are not worth living. Many disabled and sick people fight every day for the right services to improve their lives. Many are isolated, locked away, or go without vital things they need - much of our suffering is not just related to our state of health. It's easy for the newly disabled to feel intimidated and undervalue what difference support makes, and maybe it's just easier to die than trying it out while they are still struggling with the trauma of a changing body, but I believe everyone deserves a chance at living before taking the permanent way out. I believe the root of public opinion is fear of suffering - and I agree that nobody wants to suffer. So why are we not looking for solutions which do not involve people having to die? The concept of liberating people from suffering by offering them fatal medications is more like an idea for a horror movie than a social policy. It may help the public to swallow this idea, now that as a poplulation we have quietly taken up the state's unique offer to investigate all pregnant women to identify and terminate unborn children with 'defects' any time until birth, even in cases when those infants could survive unaided. Parents have morally accepted that disabled lives are not worth living, and are voting with their feet, or rather, the live contents of their wombs. It is seen as the socially responsible thing to do, even that parents are the cause of our family's suffering if they do not take this morbid way out. I think it is utterly shameful that people feel this is their only option. Parents deserve a real choice, which includes the choice to have their disabled child welcomed and included. The philosopher Peter Singer goes further: he puts forward the argument that it should be ok to kill disabled infants after birth if it's for the greater good. And he's got a point. If we accept the above program, what's the difference? Other people are starting to wonder if it is acceptable to use the same ideas later in life, to effectively "liberate" people from torturous existences by ending their lives. Disabled adults are volunteering to die, in many cases because it's easier for everyone concerned than living. According to the US anti assisted suicide organisation Not Dead Yet say, the primary reason for people wanting to die is the feeling of being a burden. Polly Toynbee seems to agree: "Besides, the loss of independence and becoming a burden to others may be a valid part of the reason why someone feels life has become undignified and past bearing." "I saw a film about the Dutch euthanasia system, which is held up as a carefully regulated system. A man I have never forgotten had his suicide approved by three doctors. It struck me that the one of the last things he said was "I don't want to be a burden to my wife." I felt like nobody could hear what he was saying. He wasn't saying he wanted to die, he was saying he didn't want to be a burden, and dying is not the only way to achieve that. I felt desolate because if that was the shallowness of their understanding, then where do we begin?" Absolutely it is natural that this makes people feel awful - but I want independence and dignity in life, not to be given drugs to kill myself! Similarly, I feel angry that families do not automatically get the support that would prevent anyone becoming a burden. We certainly have the capacity to do this, if government chose to release the funding. Polly Toynbee herself, quoting the National Council for Palliative Care admits that "the least affluent get the least care." It seems a shame that in the face of this evidence she concludes that assisted suicide clinics are the answer. But I suppose that's not entirely surprising for someone who once wrote that "the right to life is not an absolute. It is inextricably and untidily linked in almost every case with social and psychological considerations, as well as the money that might have bought more health and happiness elsewhere." Let's get the "death with dignity" myth smashed once and for all. No one gets dignity in death. Being dead simply cannot give the dead person more dignity, still less a better quality of life - so suicide cannot be the answer to the question of how people's dignity and quality of life is improved. Whilst it is true that death would ease my suffering, it would also end my life, leave my children motherless and homeless, break my lovers' hearts and end my usefulness to society. I don't want to die, I have already faced that possibility once and the value of every day of my life is immense. The benefits of living outweigh the consequences of my death a hundredfold - what price a mother? It's not a tough decision. One day, I will die, like all other humans, and if I wanted to die at my own hands in this country I have already have a right to commit suicide. If I want to take advantage of that one day, I will, and in almost all situations of possible illness there are ways to do it - as long as I continue to have independent living - the healthcare, support, equipment, housing and access I need to life and the living. My body is still deteriorating. But my independence is going to tangibly improve next week when I'll be drinking coffee from something resembling a baby's beaker in the mornings, so I don't have to have my care staff hold the cup and straw, or burn myself. I am also awaiting equipment so I can get up without human assistance and go to the toilet when I wake, on foot or using my wheelchair, depending what suits. All by myself. These are just some simple examples of how the right support or equipment increases my ability to have a decent life, but I could list many more. These are the things that give me a shot at equality in life, the things which enable me to participate and have value as a human being in society. "Our underfunded and discretionary systems of health and social care, coupled with rampant discrimination, are having fatal consequences for disabled people. But, rather than tackle these issues head on - to choose life, in Irvine Welsh's now famous phrase - the warping effects of our discourse on disability have made death seem the only humane option." I think our current working population ought to reject government and media fear-mongering, which lets the state off the hook, and ask the government for a better deal than death for their money, for those whose suicidal feelings are usually caused by neglect. I can't point you to accurate figures on this, as it's not in the interests of the state purse to study it. What I can tell you is, that in over a decade of experience of disability rights activism I have met hundreds of disabled people and people with serious illnesses, none of whom are privileged enough to be suffering from their illness or impairment alone. For all those reading who still think we need suicide clinics, I ask you this. Are you happy to support the idea, knowing that one day someone might facilitate you or others to die, at least in part, due to external factors which could be changed? If not, then this is the time to secure all our futures by fighting against these clinics and deciding to fight for inclusion, independent living and assistance to live, not assistance to die.